How many of you have started your wedding planning recently? I'm guessing quite a few since we're right in the middle of engagement season. After you informed all your closest friends and family, made the Facebook announcement, you jumped online all giddy and ready to go. In the age of Pinterest, I know a lot of brides have a very clear vision of what they want their big day to look like. In fact, you've probably been planning this since you were 12. It might not happen right away, but the deeper you get in to your wedding planning, you're going to come to the realization that it is a lot harder to make that vision a reality than you thought it would be. You're going to be pouring over hundreds of websites thinking to yourself, "IT SHOULD NOT BE THIS HARD TO FIND 2 INCH CORAL RIBBON!!!" Or something to that effect. I went through it, most of my friends went through it, and let me tell you, it is freaking frustrating. You'd think that in this internet age, where there are literally THOUSANDS of products and supplies to choose from, you should be able to find that perfect shade of teal. One place where this terrible phenomena is so apparent is invitations. These days there are so many different websites with hundreds of designs, colors and textures to choose from. But even then, it is near impossible to find one that matches the event you are so carefully crafting. At this point, you've spent countless hours searching and you're thinking, "I just want a design with Peonies in coral with a teal vintage font. Where, oh, where are yoooooou???" Most of the time, you will end up settling. And then 3 months later when you're desperately trying to find place cards to match the invites you didn't even like that much in the first place and they are no where to be found, you will be pulling your hair out. Don't do that. You're getting married in a month, you need your hairs. This right here is why hiring a professional designer is worth its weight in gold. Not only do you not have to go through the trials and tribulations of the "The Search", you won't have that regret of knowing that those details you could see perfectly in your head are not perfect. Your mom will tell you, "Don't worry about it, Sweetie, no one will notice." But you will notice, and that's what matters. It also saves you time, and is one less thing to worry about. You won't have a situation where it's a week before your wedding and you're thinking, "CRAP! PROGRAMS!! It's ok, I'll just print them up on the computer." 4 hours later, you're one more paper jam away from chucking your printer out the window, and you find 4 typos. After you've printed and cut out half of the programs. Commence fetal position and sobbing. And the biggest point of all? This celebration is unique to you. It's the time to really showcase your tastes and style as a couple. Why should you settle for sub-par invitations that do exactly the opposite? I worked with a bride this past year who described the style of her wedding as, "Vintage glam meets rustic meets 1920's meets mountain meets Tim Burton." Yeah. She would have NEVER found that in on online shop. I was able to fulfill her desires with a custom design, and she could not have been happier. 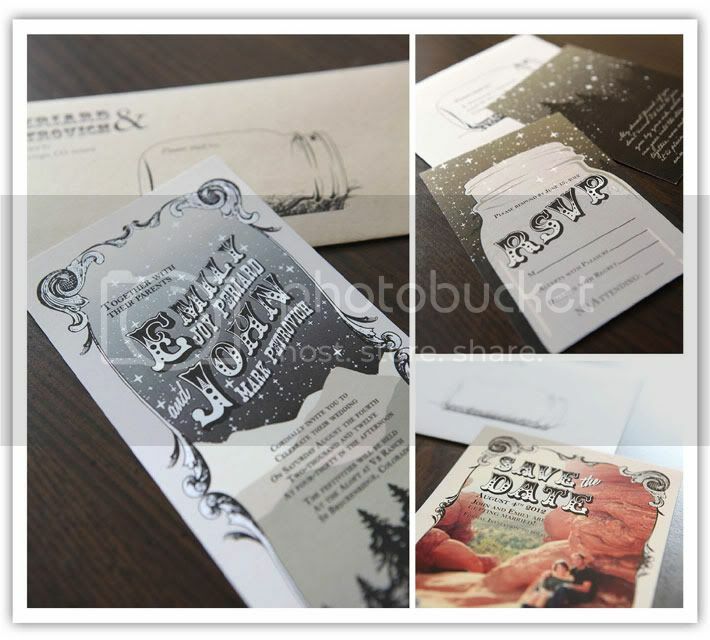 The invitations sets the tone and mood of your celebration months before your guests even arrive. Just remember, when you hire a professional like me, I am working for YOU. Your happiness is my number one priority.